Reigning Monster Energy NASCAR Cup champion Martin Truex Jr.’s win at Pocono Raceway over the weekend provided a good glimpse at how the 2018 title hunt may well shape up. 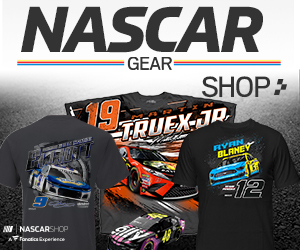 Truex picked up his second victory of the season and is the only driver other than five-time winner Kevin Harvick and four-time winner Kyle Busch with more than one win. And those two sure-bet title chasers were right on Truex’ No. 78 Furniture Row Racing Toyota’s bumper – finishing third and fourth, respectively. Just behind Truex, however, was 24-year old Kyle Larson, who notched his third runner-up finish of the season and fourth consecutive top-10. Many left Pocono with good reason to feel the race may have been a preview of what to expect in the Homestead-Miami season finale that crowns a champion. “I’m good with it,” the Chip Ganassi Racing driver Larson said smiling on Sunday. “Let’s do it. As the series begins stock car’s Summer Solstice, it’s compelling and telling to see how the young drivers such as Larson have historically done at this week’s 2-mile Michigan Speedway. Certainly the veterans such as Busch, Harvick and Truex have quickly reminded everyone they are repeat championship-worthy, but this week’s Michigan venue, in particular, has recently been a track where the young stars have earned headlines and earned respect. Larson isn’t just the defending race winner, he has actually won three straight at Michigan, including this week’s race from the pole position last June. Five of his eight starts at the track are top-10 finishes, four of the eight are top-three results. Michigan has proven itself a mecca of late for NASCAR’s rising young Cup talent. Consider this. In the June, 2017 Michigan race, Larson won, Elliott (then 20-years old), finished second , Joey Logano (then 26) was third and Ricky Stenhouse Jr. (then 28) was eighth. 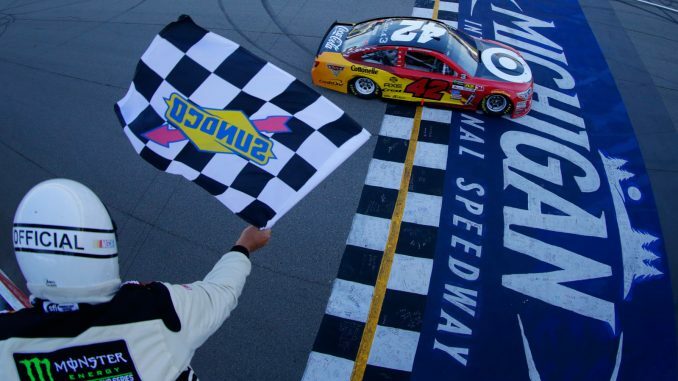 In the August, 2017 Michigan race, Larson won again, Erik Jones (21 years-old) was third, Chris Buescher (then 24) was sixth, Austin Dillon (then 27) was seventh and then 20-year old Elliott was eighth. Half of the top-10 was under the age of 28. Logano, 28, has two wins and three pole positions at Michigan and has finished out of the top-10 only ONCE since 2012. Jones, 21, finished 13th and third in his two starts at his home state venue – leading five laps in the late summer Michigan race. Elliott, 22, who finished 10th at Pocono on Sunday, actually had an amazing string of second-place finishes in his first four starts at Michigan. He was eighth in the late summer race there in 2017. And as he is prone to do, the young talent shares so much of that credit with his crew chief on the No. 24 Hendrick Motorsports Chevrolet, Alan Gustafson. “He has won races there,” Elliott said of Gustafson before last year’s Michigan race. “He has a good feel for the racetrack. We ran well there the first race and I really think because we ran well, we went back and worked harder to try to run better. Larson had a win (at Fontana, Calif.) and five runner-up finishes before his June Michigan masterpiece – from pole position to race trophy – last year and seems to be carrying that same momentum with a runner-up this past weekend. Of course, Busch, Harvick and Truex may have something to say about the Michigan “young guns” recent trend considering their own early 2018 season dominance. But there’s no denying this track certainly has given plenty of hard-earned optimism and enthusiasm to NASCAR’s newest Generation-Fast. “I’m excited to go there off of three wins in a row,” Larson said. “You know, for whatever reason, we’ve been fast there. We actually weren’t that fast the last one we had, but we were able to have some good restarts at the end.